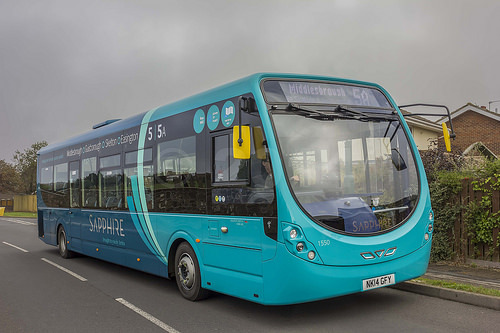 Following feedback from passengers and reviews of current passenger trends, Arriva North East are making changes to service 5/5A/X5 from Sunday 21st February 2016. The biggest change will see service X5 being withdrawn, due to low passenger usage.Service X4 and 5 will continue to provide journeys between East Cleveland & Middlesbrough. Due to the amount of passengers using the peak time services arriva are improving the morning and afternoon peak frequency to a bus up to every 10 minutes! At these times Service 5/5A will combine between Skelton, Guisborough, Ormesby & Middlesbrough to run more frequently, giving more options for passengers in these areas. Also, Service 5 will extend beyond Skelton to Easington up to every 20 minutes at these times, again, providing more frequent options for passengers in East Cleveland in lieu of Service X5. locally within the Lofus area, we're revising the times at which Service 5 operates into the villages of Skinningrove and Liverton Mines, at the request of local residents and councillors who suggested the current timetable was not as convenient as it could be. Furthermore, on Sundays and Bank Holidays, we're trialing a revised timetable in East Cleveland that will provide a 2-hourly service for Liverton Mines and Skinningrove, again at the request of local passengers. To checkout new timetables for this service click here.